Founded by my friends Greg and Silvia Reznik, Dellaluna is a journey of passion with a strong creative point of view. The reinterpretation of Venetian codes through the lenses of international luxury makes the Maison unique. Dellaluna is also a work of preservation. Preservation of secular craftmanship and redeployment of know how’s with an exciting vision of what cultural luxury should be. The city’s heritage, secular craftmanship and avant garde spirit as well as its innate sense of glamour and sophisticated lifestyle have inspired the creation of signature leather goods, jewelry and perfumes. DELLALUNA pieces are designed and hand crafted in its ateliers and presented at the Maison located in the heart of Venice at San Marco 1312 on Calle Vallaresso. Palazzo Dellaluna sits between the Canal Della Luna and Piazza San Marco. The Leoni symbol has been the house crest since the twelfth century when the Palazzo was owned by the church and home to the Templar Knights on their way to the promise land. The Maison has lived many artistic and historical events – it is the first soil where the Italian Iron crown “Corona Ferrea” was given back to Italy. 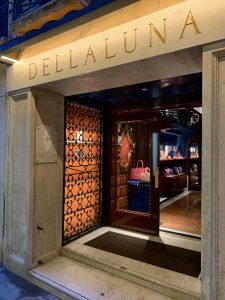 If Dellaluna starts in Venice it’s iconic pieces can already be seen walking the streets of Paris, Tokyo, New York or Dubai as the Maison reaches an international audience of aficionados who look for the exceptional in every detail. I would say if you are looking for a great piece to bring home, a stop at DELLALUNA is compulsory!